It’s all in the family with the Hendersons at Colorado’s Fox Hollow Animal Hospital, where an endearing family of vets has the treating and caring for animals in their DNA. 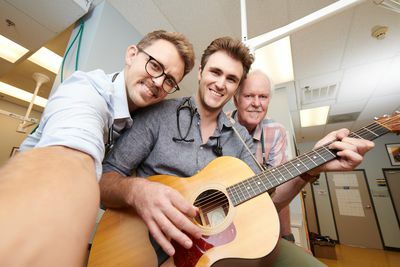 Two years ago, the Henderson’s became familiar to millions when now 30-year-old veterinarian, Dr. Ross Henderson, became a viral sensation; video of the young, handsome vet strumming his guitar and serenading a nervous furry patient captivated animal lovers’ hearts. Now in this exciting new series, Animal Planet’s global audiences will meet the rest of the Henderson clan, and experience the joy and empathy they bring to every animal in their care - from parrots and puppies, to guinea pigs and goats. When life is about animals, laughs, hugs and family there’s no telling what each day will bring when you are HANGING WITH THE HENDERSONS. The series premieres Friday, Jan. 11 at 9 PM ET/PT. Fox Hollow is very much a family-run clinic, with multiple dedicated Hendersons working both on the front lines and behind the scenes. 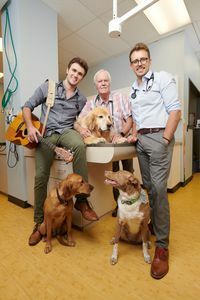 Dr. Tony Henderson and his wife Debbie with their sons Dr. Ross, Dr. Ryan, and Cole plus the extended clinic family and numerous pets, including Tony’s beloved golden retriever and sidekick Lord Barrington, work hard and have fun in their warm and welcoming offices. Tony, who turned his passion for animals into a successful 30-year career as a veterinarian, opened his clinic when his sons were little boys. All four Henderson brothers grew up working in the clinic, and two of them followed in their father’s veterinary footsteps: Ryan, whose love of animals and biology led him to his dream career in veterinary medicine; and Ross who treats a diverse range of animals from kittens to kangaroos.